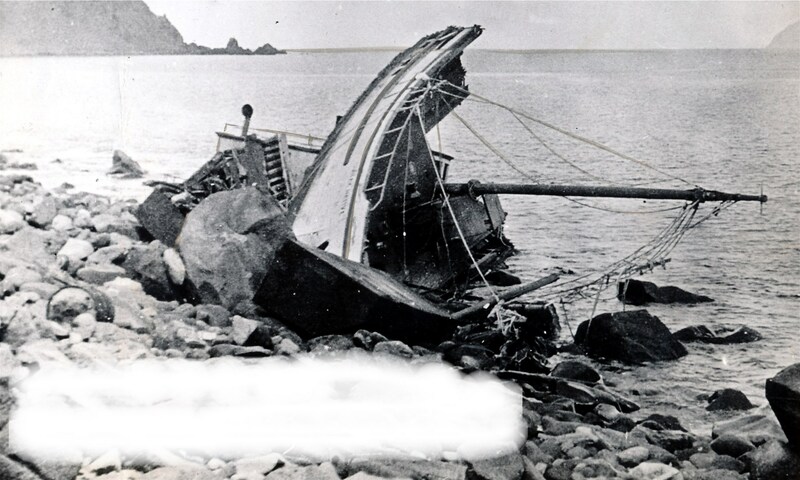 EAGLE (1980) The 92 foot steel crab fishing vessel Eagle capsized and sank during the night of October 31 / November 1, 1980 approximately 40 miles off of the Pribilof Islands. The vessel was in route to the crab grounds when it developed a starboard list and capsized. The crewmen were able to put on survival suits before the vessel rolled over completely. They were rescued by the fishing vessel Calista Sea. EKATERINI G (1965) The Greek steamship (converted Liberty Ship) Ekaterini G stranded and was lost October 26, 1965 on Great Sitkin Island 18 miles from Adak Harbor. The vessel had lost her propeller 500 miles south of Adak and been taken in tow by the tug Tawakoni. The towline parted in 85 knot winds and the Ekaterini G washed ashore parallel to the beach. One crewmember was lost. The remaining crewmembers were rescued by Navy Helicopters. The vessel had departed Seattle August 10, 1897 bound for Saint Michael. At the time of the casualty, she was valued at $10,000 and had no insurance. ELIZABETH (1904) The 327 ton wood scow Elizabeth foundered and was lost 270 miles NWW of Cape Cheerful at 6 a.m. Monday August 8, 1904. She was under tow by the steamer Irene of Port Townsend, having left Unalaska August 4 bound for Saint Michael. The Elizabeth was loaded with 190 tons of cargo including 40 tons of coal and 100 cords of wood, all valued at $500. The only crewman of the Elizabeth was aboard the Irene at the time of the loss. The cause was a strong gale and heavy seas. The Elizabeth was valued at $5,000 and was only two months old at the time of the casualty. The casualty reports the value of the Eunice at $17,500 and her insurance $13,500. The cargo was fully insured as well. Comment: H W McCurdy (Pg 419) has the diesel powered fishing vessel Sunrise lost at Carlisle Island the same year. EXODUS (1988) The 86 foot crab fishing vessel Exodus caught fire and burned January 17, 1988 approximately 60 miles north of Dutch Harbor. The processor Geng Hai Bajk rushed to the scene to assist.